Summer draws to a close, and the best way to commemorate it is live campfire ghost stories! 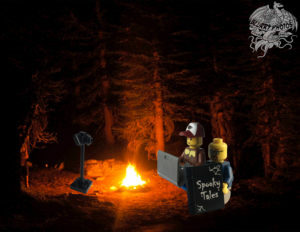 David and Dave set up shop outdoors for a Patreon-streamed live recording of this year’s campfire ghost stories, and the results were naturally scary! With tales that were actually somewhat legit, this year’s edition is one to remember. Spooky seaweed, summer camp killings, and unpunished impunity highlight the selections. Listen to mother nature’s crickety input and wait with anticipation to hear if live flames and Blurry Photos actually mix. And don’t forget to support Mark Soloff by pre-ordering a copy of his new book, The Silent Scream of Melania Trump! Grab your marshmallows and don’t worry about the sounds in the woods behind you, this episode is all you need now.